A web application, also a web app, is any application that uses a web browser as a client server. There are different types of applications, they can be simple like sign-in form on the web or message board, or they can be complex like a spreadsheet or word processor, – LifeWire writers. PC Mag expands the meaning of web app, explaining that it is a program that uses software that is downloaded from the Internet. In this article we take a look at the demand for web developers, how to find developers, how to hire web developers, how much does a web developer make and web developers job outlook in general. 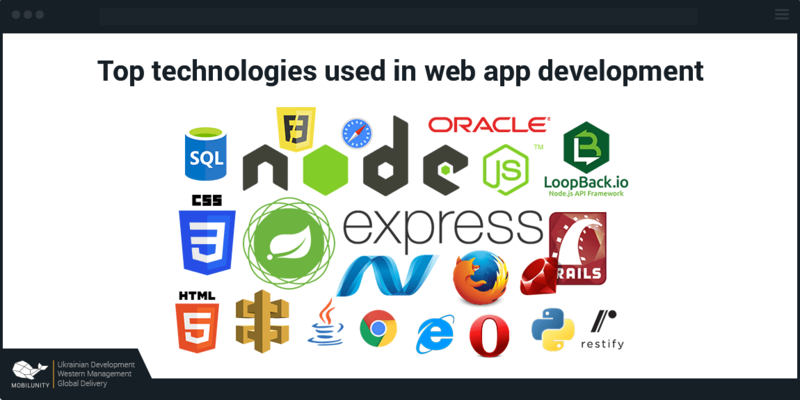 Apparently, it is expected that modern web developer for hire is educated in all of these areas. Besides regular requirements for web app developers technologies, there are more specific ones, indicated in the article on InfoWorld. Customization, efficiency, and easy usage boost quick development of web app hot trends that most web app programmers follow. Preprocessor translates the new code into the language of a different code language and allows coders to make the data to conform with the requirements of a different program. These are the lightweight tool that packages web app into virtual container and run it on any server on Linux, and this makes them very convenient in use. Apps are now created by simplified technologies, some of them even go beyond HTML5 and are able to control much more than the previous generations. There are apps controlling events and content of your applications and web pages. New web applications are front ends to big databases with content. Whenever there’s an inquiry for information for the web app, it takes it from the database and loads it. In this way, a web page can work like an application. Artificial intelligence developer is now used for storage of big data, its selection and proper functioning. With rapid development of robots, programmers will need to write code to control the newly appearing machines. It is a new method which Spark developers use to save big data that is able to get the meaning from the big volumes of data, so the code runs many times faster. Video tags have now become also a part of web apps, since video is available not only on YouTube or Vimeo. After you decide what are the specific techniques of potential web app coder of your future startup, you will use various methods to find web developers. There are three main ways of hiring a web developer for your startup: hire freelance app developers, find a web developer from outsourcing, or outstaffing. Mostly, firms tend to seek the freelance web app developers for their businesses. They also use services of outstaffing companies or look for outsourcing specialists for hiring web developers, as Proposify informs. It is often used to hire a web developer for short-term projects. Often web app developer salary and the web developer cost in general on freelance can be the cheapest option. No devotion to your project. This is another popular option to find web developers for hire for a startup, as it goes in the article on LinkedIn. Web app devs are outsourced for one particular project and they take all the accompanying work as well, such as coordination, payments of salaries, quality control etc. Its key drawback is the cost, since outsourcing requires finances, and often you will not need to be engaged in the project, the outsourcing company can do it for you, which is often not acceptable for IT startups. No necessity for personal control of the process. It offers you the team of experienced devs only, the quality control and their management is up to you. This is good, because you are then more involved into the process and have most of the process under your control. Some entrepreneurs consider this to be a drawback of this form of cooperation, however, the CEO of a new business should be able to control the processes in the company more than if he’d use outsourcing services. Outstaffing is cheaper than outsourcing, which ultimately is its strong side. You control the work process. For some entrepreneurs, personal engagement of CEO required. In case you are wondering how much does a web developer cost, here we are to provide the web developer job outlook and the developers salaries around the world. The website developer cost varies a lot depending on the country. You may ask “How much do web developers get paid in the USA?”. According to PayScale, the average salary of web app programmers in US is $5,378 a month. The answer to the question “How much does a website developer cost in Germany?” is $3,438. And in the UK they earn $3,531 per month. These salaries are a bit high, so you may want to know how much web developers make in Ukraine. The average monthly salary of web programmer in Ukraine is $2,000 per month. Now you are aware of how much is a web developer getting per month. The answer to the question how much does a web developer make a year is $57,957 on average. Besides the location, the prices vary depending on web developer titles. If you don’t know how to find a web developer for the lowest web developers prices, we are here to help you out. Mobilunity has a strong team of recruiters with more than 7 years of experience. They know all perks and secrets of how to find web developers who would fit perfectly your project requirements. Besides, Ukraine is known to have the huge amount of professional well-educated programmers, that’s one of the reasons why Ukrainian web developer demand is so high. Your dedicated team of Ukraine web developers should consists of those people whom you will trust and who will be engaged with your startup and its products. So, if you are still hesitating where to hire high quality app developers, contact Mobilunity. We will meet all your requirements and find your dream team of devs with significant international experience. Read our other fresh articles on Embedded software developer salary. Mobilunity is your best option to hire skilled dedicated web app developers to work on your new product.